« Follow us on Social Media! 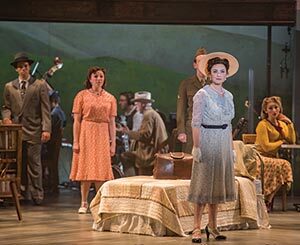 “Bright Star” A Magnificent Hit from Lyric Theatre! Steve Martin has always been a favorite for anyone needing a laugh but he can write a heart-wrenching plot that will cause tears to flow down your cheeks. Martin is the playwright responsible for the book, story and music of “Bright Star” in collaboration with the amazingly talented Edie Brickell. The two of them have created a fantastic musical that, in the expert hands of Michael Baron, is Lyric Theatre’s latest hit production. The story is set in the south and the music style is bluegrass in the period just following the war. A soldier who wishes to write, Billy Cane, has returned home to start his civilian life as a writer. He journeys to Asheville to submit his stories to the Asheville Southern Journal. There we meet the hard-to-please editor, Alice Murphy. We have seen her briefly as a young woman who also wishes to write a generation before. The action switches back and forth to her story in the 20’s and his story in the 40’s with the action taking place in Raleigh, Asheville and two blue ridge hamlets. We begin to see the connection between the two as Alice mentors Billy, and we suspect a deeper connection. We are not disappointed! Baron has a superb cast for “Bright Star” headed by the versatile Bligh Voth as Alice Murphy. Her vocals and acting are considerable aiding her in playing a young woman aging over a period of 23 years realistically and stirringly. Oklahoma audiences are thrilled to have her back at Lyric again. Voth is stunning and she is definitely the star of the show leading a cast worthy of her many talents and soaring voice. 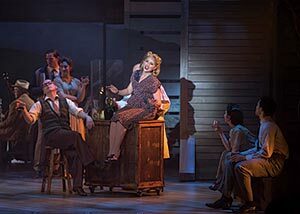 Ken Singleton as Billy Cane makes an impressive debut at Lyric with his outstanding vocals and acting range. Michael Isaac is also a welcome newcomer to Lyric Theatre and his performance as Jimmy Ray Dobbs is visionary. He plays both the young lover of the innocent Alice Murphy and he shines as he ages gracefully to the older man, a little jaded, but still in love. The two of them have powerful chemistry. Another newcomer to Lyric is Patty Irwin as Margo Crawford, the young woman who is Billy Cane’s friend and editor. She is convincing as she portrays the supportive friend, but the audience can certainly see how much she loves Billy long before Billy does. The two of them relate marvelously well and as a result Singleton is a true star with a determined glow. Jonathan Beck Reed nearly steals the show as the devious greedy villain, Mayor Dobbs. As the father of the young Jimmy Ray, he does everything he can to destroy the young love between his son and Alice Murphy. However, Reed is too fine an actor to steal the show; instead he makes the villain deliciously vile and his later guilt a tragic outcome. Stephen Hilton as Daddy Cane is the loving father of young Billy. His performance is excellent as always with an incredible characterization of the wise and well-read hillbilly. Vince Leseney as Daddy Murphy and Jessica Tate as Mama Murphy have a lovely chemistry as the parents of the slightly rebellious young Alice Murphy. Lexi Windsor as the seductive assistant Lucy Grant and her associate Zak Reynolds playing the supercilious hard-edge assistant Daryl Ames make life easier for their boss, the adult Alice Murphy, but hard for struggling authors. They do so providing a bit of the humor that Steve Martin is known for, using his subtlety and elastic expressions. The ensemble members not only support and understudy the lead roles they lend much to the overall vocals of the musical with class alongside vigor. They are Joseph Campbell, Marcus Canada, Jessica Martens, Carly Ann Moore, Adam LaPorte and Janna Linae Schmid. The entire cast is a composite of professional excellence and the production is top-notch quality in every way. Responsibility for the masterful performance is due, of course, to the excellent direction of Michael Baron, but also to the excellent team assembled for the production. Ashley Wells is a brilliant choreographer and her skill shows in the steps the dancers perform. The movements reflect the hill country origins of the dance, but express the attitudes as well as the hopes and dreams of the characters. Music Director Brian T. Hamilton knows his music, and understands the time and place well. He leads a talented band of musicians including Brian Belanus on guitar, Jonathan Cross on mandolin, Michael Geib on bass, (upright) David Hardman on drums, Patrick Conlon on fiddle and Bob French on banjo. These talented musicians are masterful in their own right, making an impressive statement yet never overpowering the excellent vocals. Technically the show is beautifully put together with a lovely set and excellent lighting from Shawn Irish with sound from Kevin L. Alexander. Jeffrey Meek designs wonderful costumes—ladies in the audience will envy the flattering costumes of Alice Murphy and the cast. Theatre is essentially team work, timed perfectly and working in perfect synchronization and Lyric’s productions display that excellently but the importance of that team is revealed most beautifully in “Bright Star” a true musical theatre hit. 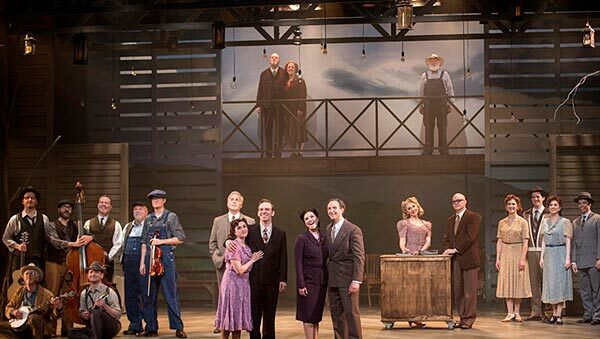 Steve Martin and Edie Brickell make us laugh as well as cry and Baron’s team translates the musical beautifully. There isn’t a dry eye in the house—just blame it on the fog machine in the train scenes! 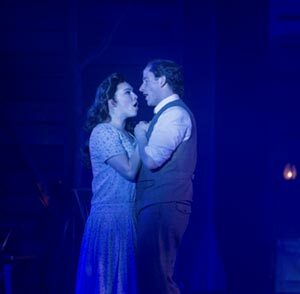 “Bright Star” at Lyric on the Plaza plays April 3, 2019 through April 28, 2019. The Plaza location is 1727 N. W. 16th Street in the beautifully renovated Plaza district between Pennsylvania and May Avenue. The atmosphere at Lyric is always welcoming from meeting ‘Security Michael’ at the parking lot one block west of the theatre at Lyric’s administrative offices to the entire staff at Lyric Theatre—box office, concessions, etcetera. The entire experience is always a delight. The box office telephone number is 405-524-9312 or visit www.lyrictheatreokc.com. Patrons will be well-advised to reserve on a night that Lucas Ross does a delightful pre-show at 7:00 with his banjos; that is an excellent opening act for “Bright Star” so don’t miss it!